The most high profile prospect on the field for Friday's 5A state championship is not a member of the 17th-ranked team in the country. T.L. 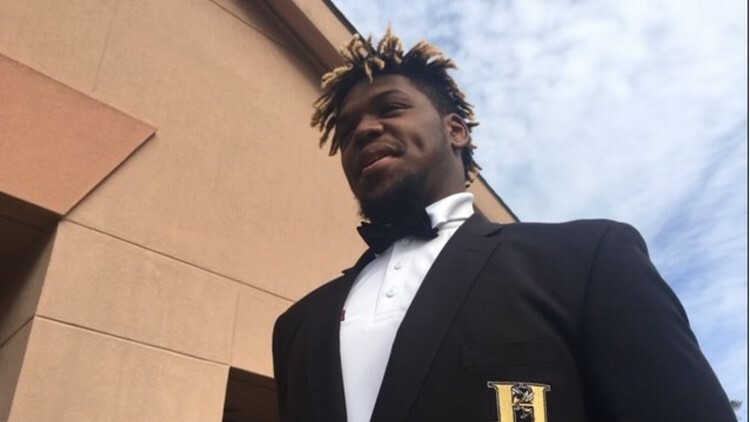 Hanna's Zaach Pickens is a 5-star commit for the Gamecocks. Zaach Pickens has played double duty for T.L. Hanna this season and that's a major reason why the Yellow Jackets are in the AAAAA state finals. Pickens is a 6-4, 240-pound defensive end who is rated as 5-star prospect. He is a USC commit and to date, Will Muschamp's most high profile pledge to the program. Pickens will get a first hand look at what a game at Williams-Brice Stadium is like Friday night at 7:30 p.m. as his team will face Dutch Fork for the title. Pickens admits he will have mixed emotions about playing in his final game wearing his high school colors. "It's kind of a sad and happy feeling at the same time because I'm going to be starting my destination, changing my location, leaving everything I made at Anderson with my team and everything," Pickens said. "So, it's kind of sad and happy at the same time." Pickens is also T.L. Hanna's leading rusher as the Yellow Jackets use Pickens in their Wing-T offense to chew up the clock and keep the chains moving. Slowing down Pickens will be just one of the challenges for the two-time defending state champion Silver Foxes. "Oh, yeah, he's a special player on both sides of the ball," said Dutch Fork head coach Tom Knotts. "He's a load when he gets the ball in his hands. He's a terror over there at defensive end. He's a great high school player and going to be a great player on the next level. But their quarterback, he's a real leader, a real winner and a great athlete, does a lot of great things, So, they're good on both sides of the ball so we'll have our hands full with them." Kickoff Friday night for the 5A state title game is set for 7:30 p.m.